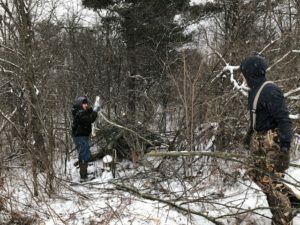 On Saturday, January 19, 2019 volunteers braved the winter storm to build small game brush piles at St. Clair Township State Game Area. The little known area, which is only 110 acres in size, is frequently used for rabbit, deer, turkey, and coyote hunting. Outlying on the perimeter of the farmed area were Boxelder and over-mature Jack Pine, which were hindering ecological progression in the area. The day before the project, DNR Wildlife Technician John Darling, volunteer Jaime Salisbury and myself went out to fell the trees in order for the Saturday volunteers to be able to dedicate more of their time to creating quality brush piles for the area’s wildlife population. A total of 15 trees were dropped and made ready for work the next day. As Saturday’s weather progressed, the snow became heavy and the wind was cold. John, his seasonal technician, myself, and a few volunteers stuck it out and were able to accomplish all of the piles that we set out to make. It was nothing less than unfavorable conditions, but everyone made the best of it and finished the task at hand. 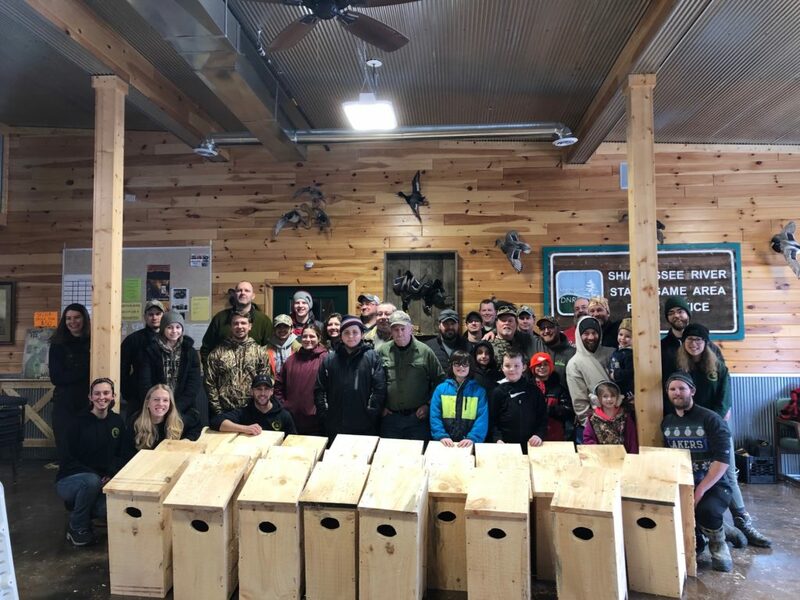 Then on Saturday, February 23, 2019, over 50 volunteers gathered at the DNR St. Charles Field Office at the Shiawassee River State Game Area for a morning of wood duck-related projects. 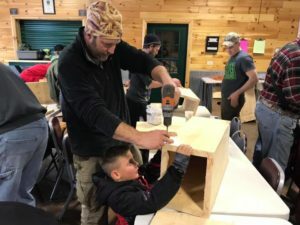 To kick off the morning, participants were given instructions on how to construct wood duck boxes by DNR Wildlife Biologist Jeremiah Heise. Supplies and tools were provided by both the DNR and the Shiawassee Flats Citizens & Hunters Association. After building 30 boxes, everyone took a lunch break and got a chance to talk about their common interests and reasons for being involved in the project. Shortly thereafter, everyone took to the outdoors on foot to check preexisting boxes on the Area. They were checked for usage, success, and nesting materials were replaced for the upcoming season. Nearly all of the boxes had been used in the previous season, with evidence of hatched ducklings and leftover shell pieces. There were about 10 kids involved throughout the day, and nothing quite compared to their faces as they peeked inside of the box for the first time and reported its condition to the rest of the group. With the bitter cold temperatures and extremely snowy conditions, both myself and Jeremiah were unable to get into our offices throughout the week before the project. Thankfully and luckily, members of the Shiawassee Flats Citizens & Hunters Association are incredibly dedicated and committed to the success of projects at the area, and stepped up when the rest of us were unable to. Without them, the project wouldn’t have been nearly as successful, and the amount of work that we were able to accomplish would have been diminished significantly. Partnerships and dedication such as this truly make this program what it is, and we’re grateful for the opportunity to work with and know such incredible people. 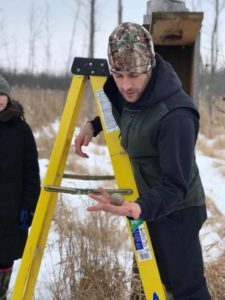 From the DNR Biologists, Technicians, and seasonal workers to involved groups and our individual volunteers, thank you for your dedication and commitment to Michigan’s Natural Resources and the On The Ground program. March is an incredibly busy month for the program, and we’d love to have you join us at one of our projects! For more information, visit www.mucc.org/on-the-ground or email me, Hunter Salisbury at hsalisbury@mucc.org.